The Charadrii encompass the Chionididae (sheathbills), Pluvianellidae (Magellanic plover), Charadriidae (plovers and allies), Haematopodidae (oystercatchers), Recurvirostridae (stilts and avocets), Ibidorhynchidae (ibisbill), and Burhinidae (thick-knees). Except for the Chionididae, these birds are characterized by the loss of the hallux. The Paleogene fossil record of the Charadrii is very poor. Assignment of fossils to the Recurvirostridae is based on very fragmentary remains whose identification is doubtful. "Recurvirostra" sanctaenebulae Mourer-Chauvire, 1978 from the late Eocene of France is known from the proximal end of an ulna (Mourer-Chauvire 1978), and its identification needs to be substantiated with additional bones. Even if this species belongs to the Recurvirostridae, it is unlikely that it can be classified in the extant taxon Recurvirostra. 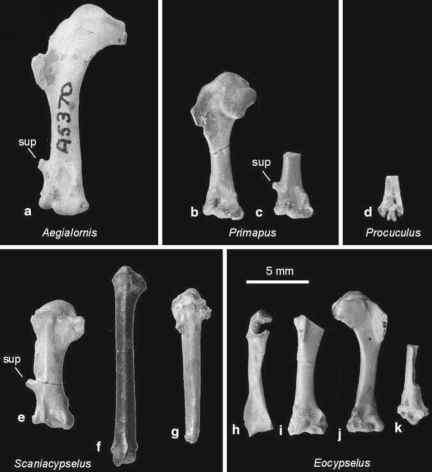 Another putative recurvirostrid, which was described by Harrison (1983) from the early Eocene of Portugal, is based on an incomplete femur and cannot even be reliably assigned to the Charadriiformes, let alone Recurvirostridae (see also Mlikovsky 2002). The same is true for reputed Recurvirostridae and Burhinidae, which were reported by Harrison and Walker (1976a) from the late Eocene (MP 14-16/MP 17; Mlikovsky 2002) of England. Hou and Ericson (2002) described a humerus from the middle Eocene of China as Jiliniornis huadianensis and tentatively assigned the species to the Charadriidae. This assignment was, however, not established with derived features, and the authors themselves considered the possibility that the shared similarities may be plesiomorphic for a more inclusive clade. The correct identification of "Charadrius" sheppardianus Cope, 1880 from the late Eocene Florissant shales of Colorado was questioned by Olson (1985). The holotype of this species was not figured by Cope (1880) and awaits restudy. Bessonat and Michaut (1973) briefly described a charadriiform bird from the early Oligocene of the Luberon area in southern France. The exact affinities of this specimen, which has the size of a stone-curlew (Burhinus oedicnemus) and is now in a private collection in France, have not been determined. Judging from the overall morphology of the skeleton and the absence of a hallux, it may well be a representative of the Charadrii. Boles (2001b) mentioned the presence of undescribed Burhinidae in the late Oligocene Etadunna Formation of Australia.